Having the right furniture can turn any space into a productive mailing environment. 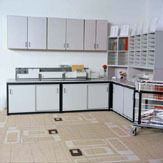 Durable and modular furniture solutions provide a fit for all of your mailroom needs. Find out how we can customize a solution to match your budget and design needs. FP furniture solutions gives you the tools for maximum flexibility and efficiency of your mail and communications operations.